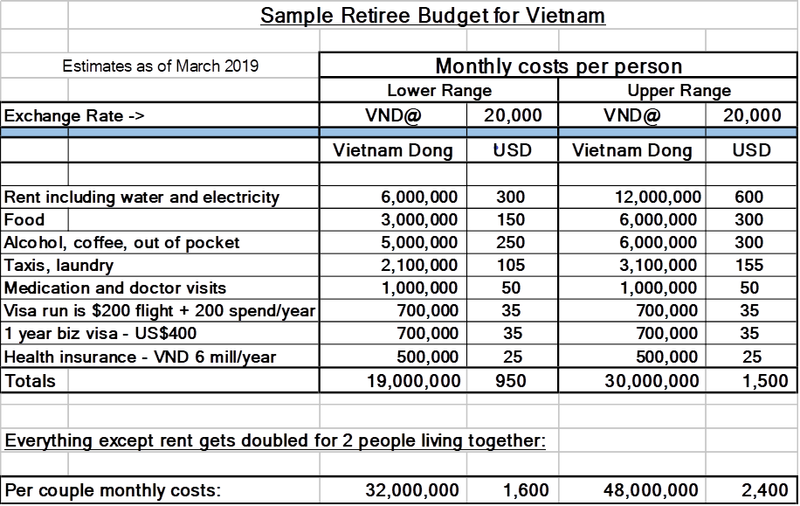 Over the past six years, I’ve lived in or spent extended periods of time in Vietnam and five other countries in Southeast Asia – a solid basis for comparing the value each offers the retiree for money spent. Some of those five countries offer a reasonable cost of living but come up short on overall quality and reliability –- roads, water, garbage management, electricity, Internet, service, building construction, and nutritious food. Vietnam offers good quality for all the above factors and it doesn’t cost a fortune to access acceptable infrastructure, goods and services. Granted, it’s still a developing country with developing country hiccups, but generally things function well. There are many types of foreigners living overseas: entrepreneurs, relocatees on company-sponsored temporary expat assignments, others who have found employment without company sponsorship, nomads, part-timers, and retirees. This analysis is not targeted at those relocatees, others with high incomes, nor at shoestring budget types desiring rock-bottom prices. Those earning well need not be deeply concerned about cost, and a bare-bones lifestyle is too basic for most foreigners, especially retired people who value comfort. There are also categories of retirees: those on pensions, both small and large, business owners of retirement age, seasonal part-timers, and of course wealthier types. The focus here is on average costs for a typical retiree lifestyle. I was an average professional wage-earner during my career, so I have a limited budget – enough to enjoy a pleasant lifestyle, although not extravagant. These estimates are based on my own experience during the three years I’ve spent in Vietnam. Your lifestyle choices and the corresponding costs will surely be different.  All estimates are in U.S. dollars at a rate of VND20,000 per dollar, although the actual rate at the time of publication is over 23,000 per dollar. I use a lower rate, thinking that the U.S. dollar is overvalued right now while the Vietnamese dong is undervalued. That 15% between 20,000 and 23,000 makes quite a difference over the months and years, so keep an eye on currency fluctuations. A one- or two-bedroom apartment in a modern complex in one of the major urban areas goes for $500-700 per month and can easily top $800 for the finer addresses. Seaside communities are growing rapidly and prices are inching closer to the big city rents. In smaller urban areas there are fewer expats and usually less suitable rental accommodation, with a one- or two-bedroom apartment costing $300-500 per month, and studios or rooms going for $200-350 per month. This space is changing rapidly and there will be upward pressure on prices as the country gains more popularity. I stay in a hotel in Da Lat because it offers flexibility with no lease and is centrally located at an all-in cost of VND5 million ($250) per month. Insurance is a must-have for any retiree because quality health care can be difficult to find, expensive, and located far away from where we live. I have a policy with a Vietnamese company which provides me with $20,000 inpatient coverage within Vietnam only at a cost of $250 per year. The purpose of that insurance is to have coverage in case of accident or sudden illness. I pay for doctor visits and medication out of pocket – both are inexpensive. There are endless expat options available from branches of international companies but they are much more expensive. I had a policy that covered me all over Asia from a U.S. provider at $100 per month which is cheap by international standards. Vietnam does not yet have a retirement visa program although I understand it’s in the works and will appear in the coming years. I hold a one-year business visa which costs $395 including an invitation letter from Immigration ($260) and a stamping fee ($135) paid upon arrival at the airport from abroad. Visa holders also need to factor in the cost of visa runs: estimate $200 for a return airplane ticket to a nearby international destination, plus $200 for 2-3 days living expenses, and take note that the trip can be done inexpensively by bus with cheaper accommodation. Eligibility for visa types also depends on nationality. Some passport holders need to exit every three months, so the cost of four visas per year and four trips per year needs to be factored in the budget below. I frequent low-level street stalls or humble restaurants, eating fresh, nutritious meals for about $5 per day. It’s realistic to double that for those who prefer a higher standard of surroundings and service. It’s easy to pay double that again in top-class establishments delivering high standard food, service, and atmosphere. Costs usually decrease as time goes on, so it’s best to consider the first year as being trial and error, after which best value restaurants are familiar. I didn’t include prices of fresh food at the local markets because often for one or two people cooking doesn’t come much cheaper than eating out, especially if you go with local food. 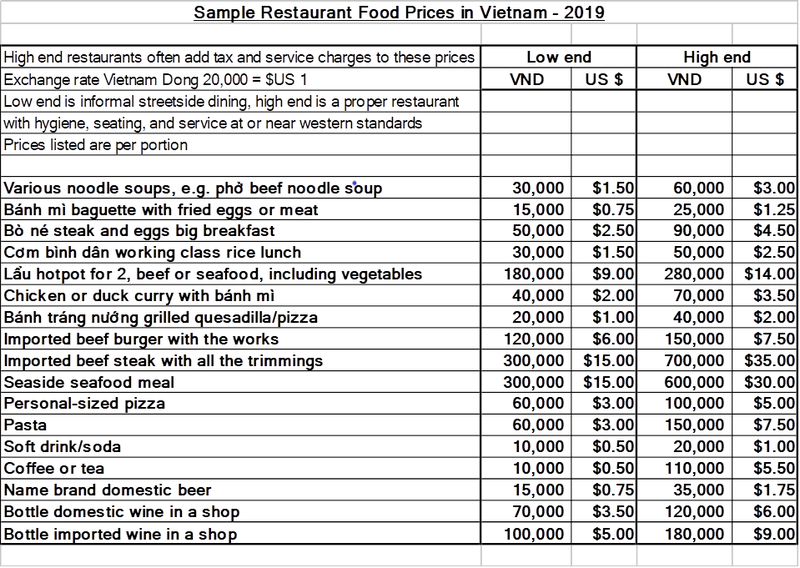 The chart below depicts typical price ranges for a few common meals, just to give an idea of cost, but even more important is the difference between local offerings and high-end dishes which often use imported ingredients. Scanning down the above list you’ll see large variations in price, such as local coffee coming in at less than 10% of the cost at the fancy international chains. Of course you’ll enjoy air-conditioned, well-furnished surroundings, huge portions, and you’ll get coffee beans imported from halfway around the world, which you need like a hole in the head. Local Vietnamese robusta beans are full-flavoured and delicious – in fact I prefer local coffee to imported one even if price was not a factor. That difference in price of VND100,000 ($5) for coffee each day in the above chart represents what I spend on food in a month! This is a good example of why cost of living numbers vary so dramatically in the media. The moral of the story is choosing your pleasures wisely and substitute local products for imports when you’re willing to compromise, and you can save yourself a fortune. If you can’t substitute, make it a conscious decision and you’ll enjoy your juicy steak or cheese so much more when it becomes a treat. Using a motorbike or car legally involves jumping through a number of hoops which vary greatly on circumstances and locations, so that’s part of the reason I travel on foot or in a taxi when required. I’ve included VND400,000-500,000 ($20-25) per week in a low-end budget and VND500,000-700,000 ($25-35) per week in the high-end budget for taxi fare. A typical 15-20-minute ride is less than VND100,000 ($5) in a regular taxi, less on a motorbike taxi. If you choose to rent a motorbike on a monthly basis, the costs are similar to what I allocate for taxis. Practically every business provides free Wi-Fi that works to the extent that I’ve never bought an Internet data package, so I’ve made no provision for data here. Personal grooming items such as deodorant, toothpaste, razors, and the like are very reasonably priced, thus not worth budgeting as line items. Laundry expense is minimal, roughly VND100,000 ($5) weekly per person. Estimates are for one person, so everything in the chart below except rent needs to be doubled to calculate costs for two people living together. My own personal budget is between $800 and $850 per month because rent and transportation are cheaper than the Lower Range costs above. 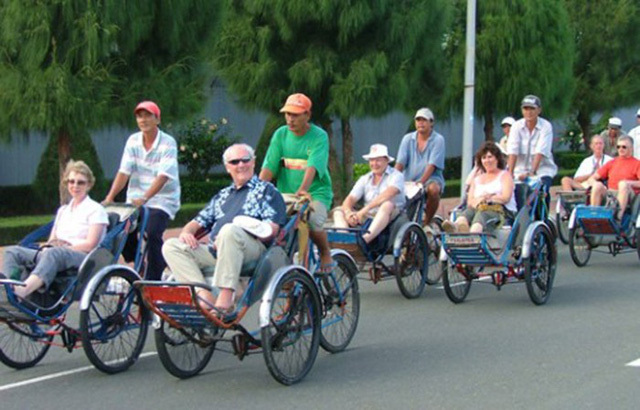 A low cost of living has merit only if we get good value, and Vietnam offers value for the retiree dollar. I was convinced on three occasions during my years of nomading that I’d found the right country only to learn I was wrong, finally dropping my anchor on the 4th attempt, so shop around before making commitments.